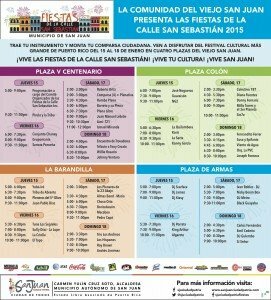 Sample Calendar of Fiestas de la Calle San Sebastián - Puerto Rico is Music! The program is usually releases a week before the celebration. There are plenty of opportunities to enjoy music. 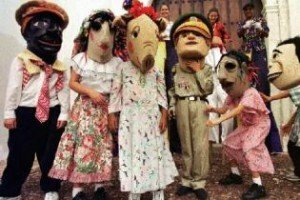 In the 2015 edition, 50 performances by the best contemporary artists in Puerto Rico were held in 4 different places: Plaza Colón, Plaza V Centanario, La Barandilla and Plaza de Armas. A sampling… what is your preference? If you like salsa, check out the events for Plaza V Centenario and Plaza Colón. Some of the bands you will be able to watch are Pirulo y la Tribu, La Sonora Ponceña, NG2, Ismael Miranda, Willie Rosario, and La PVC. If you like Spanish rock and Spanish pop, stay around Plaza Colón, specially on Friday and Saturday. Rock bands La Secta and Danny Fornaris will be there. Grammy award winners Kanny García and Sie7e will also be performing. If you like Afro Caribbean rhythms, go to Plaza V Centenario on Saturday to enjoy some plena by Rumba Plena, Plena Libre and Barreto y su Plena. Pleneros del Quinto Olivo will be at Plaza Barandilla on Thursday, and Los Pleneros de la 23 Abajo will be at Plaza Colón on Saturday. Two great bomba bands, Yubá-Ire and Tribu de Abrante will perform at La Barandilla on Thursday. For some bohemian music, go to La Barandilla on Sunday to watch Trío Los Andinos, Los Hispanos, Roy Brown and Andrés Jiménez. For electro music lovers, stay around Plaza de Armas the whole weekend. The best DJs in town will be playing there from Thursday through Sunday. © 2017 – 2018, prismusic. All rights reserved.